It’s that time of year again: our annual photo contest! To honor you and your beautiful birds, we’ve put together another great photo contest that allows you to win some awesome prizes. This year, we’re offering four categories to enter: Cutest Chick, Best Hen, Best Rooster and Best Group. See the following pages for more information on these categories and how to enter. First, read the official rules on page 56. Then, take a digital photograph, using a digital camera or smartphone set at its highest resolution. (Check your owner’s manual if you aren’t sure how to do this.) All digital files must be in JPEG format. The minimum size at 300 dpi is 3-by-5 inches. 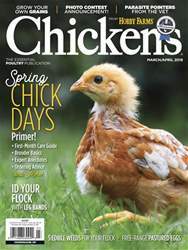 To submit a digital photograph, email it as a JPEG file to chickens@chickensmagazine.com, with the subject line “Best of Cluck.” In the email, include the category you are entering, your name, your mailing address, your phone number and any thing else you’d like to share, such as the name of the bird(s), what you like best about keeping chickens, etc. Just keep it to 100 words or less. You may enter all four categories, but you may enter only two digital photographs per category.